Stranger Things is on its way back for all your binge-watching needs. The first season felt self-contained in many ways, but there are so many mysteries yet to unravel that you shouldn't allow your friend with nothing better to do on Saturday spoil a surprise about how Eleven returns or what that thing in the trailer is. 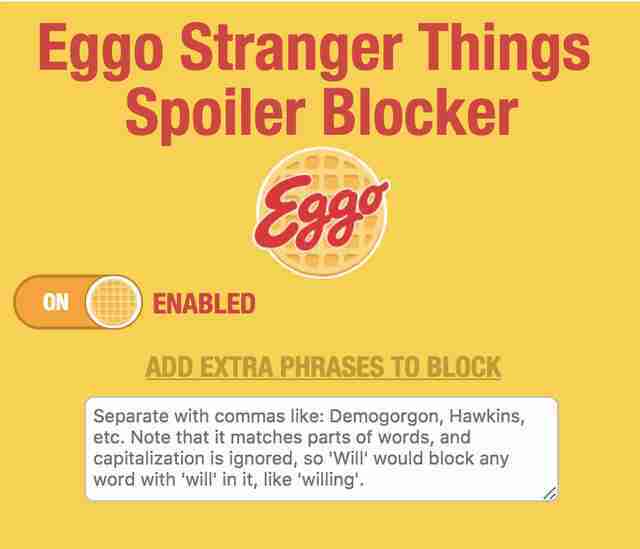 Eggo, of all things, wants to protect you from The Upside Down your friends' upside down sense of what can be said online about a show you haven't seen. The waffl... ers? waffliers? 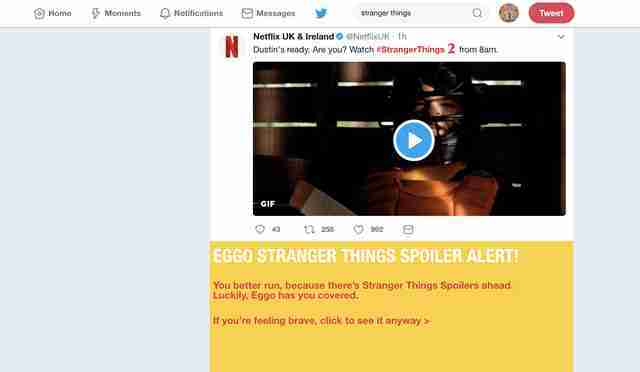 waffle people have created a browser extension that will hide spoilers until you've managed to work your way through Strangers Things 2. This gift to common decency is awfully easy to use. Install the extension, then click the Eggo icon on your browser. This pop-up will appear. Turn the extension on, and it will scour pages you're looking at on Reddit, Facebook, Twitter, and Google News for any mention of the phrase "Stranger Things" or show-related terms like "Upside Down" or "Hawkins Laboratory." In the box below where you turn the extension on, you can add any terms that you think might help squash spoilers. For instance "Demogorgon" isn't automatically blocked, but you could add it there. When you start browsing, items will be blocked out like they are above. Though, you can see "#StrangerThings" as a hashtag isn't automatically blocked, so you may want to add that. If you can't control yourself and have to see what people are saying, just click the blocked box and what's underneath will appear suddenly like the cobwebby horror of The Upside Down.